For a limited time receive a FREE 2 pack of Spider Flip Glass Towels with the purchase of this kit. Retail value of $15.98! The best leather kit for a daily driver! Guilty as charged. I tend to neglect the "family" vehicle (Honda CR-V) in my household. Why? Between the kid and the dog, I have no desire to chase after Cheetos and dog slobber every weekend! It's a family car - it's supposed to be dirty! If you're in a similar situation, be it the family car or if you simply have no desire to clean and condition your leather upholstery on a regular basis, the Daily Driver Leather Care Kit is for you. I developed this kit as a "set it and forget," twice-a-year solution to keep the single most expensive option in most new vehicles today, leather upholstery, well-protected for the life of the vehicle. The secret weapon in this kit is Leather Guard UV50. McKee's 37 Leather Guard is ideal for the daily driver because it provides far better protection than a traditional leather conditioner or protectant. It's going to resist abrasion caused by the dog; dye transfer from wet blue jeans (don't ask) won't stand a chance; accidental spills are easily cleaned without pulling out your hair. McKee’s 37 Leather Shampoo 70/30 can remove just about any stain from your vehicle’s leather upholstery. This non-alkaline cleaner forgoes petroleum solvents, silicone oils, and gloss agents. Instead, it relies on advanced chemistry to penetrate deep into the leather, lifting dirt and grime from every pore. As the cleaner goes to work, lanolin and mink oil are fed into the leather, ensuring it remains soft and supple for years to come. It’s a fantastic product. Not all cleaners are created equal! High-octane, all-purpose cleaners break down the natural oils found in the leather. These oils are added during the tanning process, giving the leather its rich, luxurious feel. McKee’s 37 Leather Shampoo 70/30 preserves these oils, extending the life of the leather. McKee’s 37 Leather Guard UV50 is not a leather conditioner – it’s a high-tech coating that not only outlasts a traditional leather conditioner or protectant, it provides superior protection as well. Leather Guard UV50 blankets leather upholstery with a crystal clear, durable shell of protection that protects against dye transfer from blue jeans, abrasion, food spills, suntan lotion, grease, and oily grime. 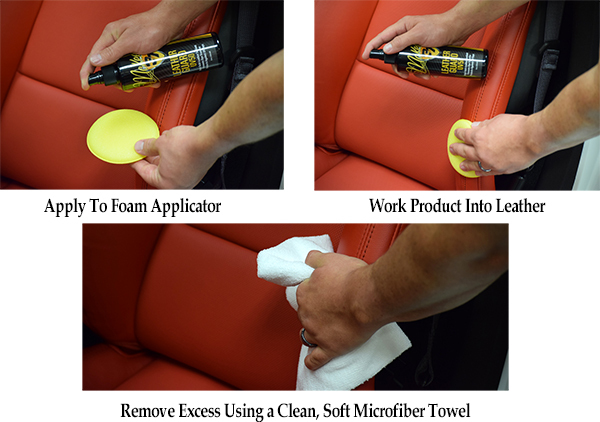 Dirty leather will wipe clean using a dampened microfiber towel. Leather upholstery is the single most expensive option in most new vehicles. What costs you thousands of dollars is often neglected during ownership of the vehicle. 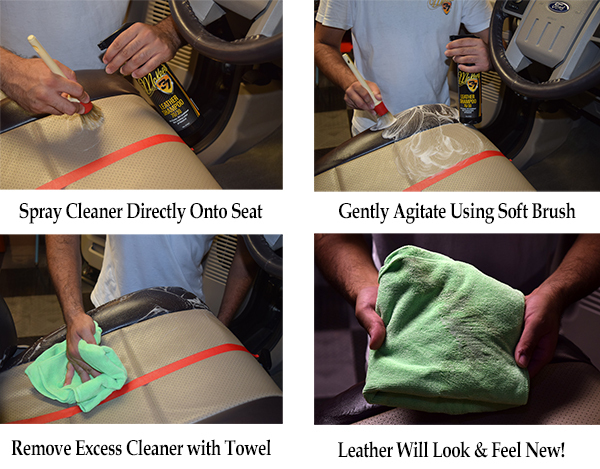 Applying McKee’s 37 Leather Guard UV50 twice a year is a low-cost investment to keep your vehicle’s leather upholstery looking and feeling new for the life of the vehicle. Use this soft-bristled brush to gently agitate Leather Shampoo 70/30. It is perfect for delicate leather surfaces that would otherwise be scratched or marred by a stiffer brush. The wooden handle will not get slippery when wet. Wipe on Leather Guard UV50 with one of these absorbent, nonabrasive foam pads. The foam is a high quality, closed cell variety that resists drips and smears as it applies products evenly. Total retail value of $88.90. You save $28.91! Excellent Product 5 Ordered this for a new Mazda CX-5 with Parchment interior. The car was not 3 days old when I used the product. Believe it or not the cleaner lifted dirt from the drivers seat and the door rest. As for the protectant, once applied you can tell there is a coating on the leather but it does not feel different. So far as I can tell excellent product. Leather shampoo - excellent 5 The leather shampoo 70/30 is the best car care product Ive used in years. It easily removed staining from baseball dirt red clay from light gray leather seats. Left the seats clean, soft, and like showroom new after 50k miles. Very nice fragrance too. Nice job on daily driver car 4 Did nice job cleaning leather on car. Cleaned twice and most dirt was gone after second dose.